On Sunday, December 2, 2007, members of the Wawel Folk Ensemble performed as part of a Christmas luncheon for the Felician Sisters at their motherhouse in Livonia, Michigan. Wawel presented its Cieszyn, Lubelski, and Rzeszow suites as well as the Karolina polka. After presenting these numbers, members of the Ensemble and the Sisters participated in a brief dance along. After the dancing, Sw. Mikolaj visited, refreshments were served, and carols sung. On Thursday, November 29, 2007, members of the Wawel Folk Ensemble performed as part of a Christmas program for members of St. Cletus' Parish in Warren, Michigan. Wawel presented its Rzeszow and Lubelski suites, the Krakowiak and the Karolina Polka at the performance, which was well received by the audience. Wawel's next performance is for a holiday party at the Felician Sisters' motherhouse in Livonia, MI on December 1. Wawel's next public appearance will be on December 24 at Sweetest Heart of Mary Church in Detroit, MI for procession during Midnight Mass. Well, if you dance the Mach you probably won't get any pierogi, however, Wawel is currently spending many of its weekend mornings and afternoons making pierogi. 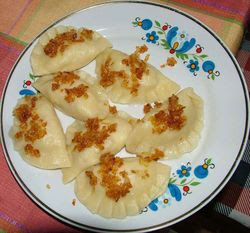 Wawel makes potato and sauerkraut pierogi every fall/winter as one of its major fundraisers. This year's fundraiser is even more important as the group will travel to Poland in July 2008 to participate in the Triennial Rzeszow Folk Festival. The funds raised during the pierogi sale will go toward defraying the cost of traveling to Poland as well as help the group to purchase new costumes. Wawel's next performances include a dinner at St. Cletus on November 29, 2007, at the Felician Sisters Mother House as part of their Christmas celebration on December 2 and at the Lawyer's Dinner on December 7. Wawel's next public appearance will be on December 24, 2007 at Sweetest Heart of Mary Church in Detroit, Michigan. Wawel will appear in procession during their midnight mass celebration. Wawel has a long history with Sweetest Heart of Mary Church and participates annually in their Pierogi Festival and Christmas Eve Midnight Mass and Easter Sunday Sunrise service. As part of its first North American Tour in 10 years, the State Song and Dance Ensemble of Poland, Mazowsze performed at the Music Hall in Detroit, Michigan. Many members of the Wawel Folk Ensemble attended the performances. 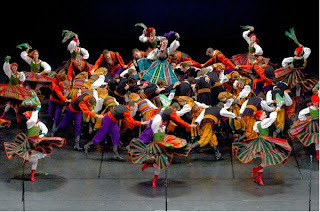 The dancers of Mazowsze were treated to several standing ovations during the course of their performance and provided the audience numerous encore performances of both songs and of their dazzling finale. Their performance was truly a feast for the senses. The 11th of November is a special day for Poles, celebrated as Independence Day, marking Poland’s return to the map of sovereign European states after 123 years of foreign rule. Naturally, regaining independence is not an event that could be discussed in terms of one specific date in calendar, but rather a long and complex process. This special date, however, marks a series of important events that gave the day a symbolic meaning. Among those events: an armistice was signed, ending long and bloody World War I; German troops deployed in Warsaw since August 5, 1915, were disarmed; and Jozef Pilsudski, the most esteemed politician at that time, held talks on assuming power and re-creating the Polish state. 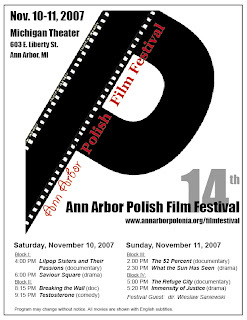 On November 10 and 11, 2007 the Fourteenth Annual Polish Film Festival was held in Ann Arbor, Michigan. On October 27, 2007, the Wawel Folk Ensemble performed at the Sadowski wedding in Riverview, Michigan. As is the tradition in Poland, members of the Ensemble presented the bride and groom with bread and salt - while explaining the significance of these customs to the guests. After the bread and salt presentation, the Ensemble performed its Lubelski suite which contains dances that would have been performed at weddings and the Karolina Polka, because after all, what wedding is complete without a Polka. On Thursday, October 18, 2007, the Wawel Folk Ensemble performed at the American Polish Assistance Association's ("APAA") annual fundraising dinner - presenting its Rzeszow and Lowicz suites. Also appearing at the fund raiser were the Lajkonik Folk Ensemble as well as a Bosnian Folk Dance group. After the various ensembles' performances, Dr. Ted Radzilowski from the Piast Institute gave a brief talk about October being Polish Heritage month and the importance of preserving the Polish heritage. The APAA was founded in the late 1960's by the late Michal Krolewski in addition to its cultural preservation programs it regularly collects goods and donations to send to orpahages located in various Polish cities. In addition to its appearances at the Labor Day events in Hamtramck, Wawel also performed at the St. Athanasius Fun Fest in Roseville, Michigan on September 8, 2007 as well as at Troy Daze in Troy, Michigan on September 16, 2007. On September 22, 2007, Wawel performed at the Polish Falcons' District Convention held at the American Polish Cultural Center in Troy, Michigan. Wawel presented it Rzeszow and Lubelski suites followed by the Karolina Polka. During discussions with some of the Polish Falcons, it was mentioned that Wawel had performed at their district convention 20 years earlier. On October 13, 2007, Wawel performed at Northville's annual Oktoberfest. While it might seem strange to have a Polish Folk Group perform at what is largely considered a German Festival, it really isn't - In October, the whole of Europe celebrates the harvest. Wawel's appearance at the Oktoberfest is doubly appropriate because of October's celebration of Pollish American heritage month. At the Oktoberfest performance, Wawel presented its Kaszuby, Lowicz, and Lubelski suites as well as Kadzioleczka and the Karolina Polka. As summer wraps up, Labor Day weekend is often a busy one. Picnics, back to school and parades dot everyone's calendars. The same held true for members of the Wawel Folk Ensemble this Labor Day weekend. Sunday, September 2, 2007 featured the Polkapalooza event at the annual Hamtramck Labor Day Festival in Hamtramck, Michigan. The event began with a Polka Mass featuring music by Big Daddy Lackowski and celebrated by Ks. 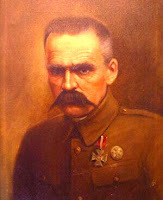 Bogdan Milosz. After the mass, the Polkas began. The bands included in the lineup were the Kielbasa Kings, Big Daddy Lackowski, and the Misty Blues. The Polka with the Stars Competition consisted of three rounds followed by the judges' scoring the rounds and then the elimination of some participants. In the final round, the judges asked that the audience vote by clapping for their favorite final couple, which was factored in with the judges' score. The judges were: Tom & Donna Skurski, Director and Artistic Director of Wawel, and Cindy Cervenak, director of the PRCUA Gwiazda Dancers of Hamtramck. After the three rounds a winner emerged...Rachel Karpinski from the Polish Sea League and her partner Wawel member Chris Ozog. Both audience and participants in the event had a wonderfull time. Discussions have already taken place about the 2nd Annual Polka with the Stars event for the 2008 Labor Day Festival in Hamtramck. Hopefully Chris and Rachel will return to defend their Polka Crown. On Monday, September 3, 2007, members of the Wawel Folk Ensemble marched and Polkaed down the streets of Joseph Campau in Hamtramck, MI during the annual Polish Day Parade. On Saturday, August 18, 2007, the Wawel Folk Ensemble performed at St. Malachy's annual parish festival in Sterling Heights, Michigan. Wawel performs annually at St. Malachy's and it is one that the performers always look forward to. To change things up a little this year, the Ensemble wore folk dress from several regions of Poland, rather than the ensemble just wearing one single regional folk dress. Members of the Ensemble wore folk dress from Rzeszow, Kaszuby, Lublin, and Cieszyn. Suites of dances from each of these regions were also presented as well as the every popular Karolina Polka. After the performance, members of the Ensemble stayed at the festival to enjoy polka and other music as played by the Tri-City Plus orchestra.